Complete this interactive seminar and you will leave with true integrative understanding of lab results and patient outcomes. Be a CLINICIAN, not a TECHNICIAN . . . be PROactive, not REactive! Learn the hidden clinical clues of labs and empower yourself to change lives as a situationally aware patient advocate powerhouse! Join Sean G. Smith, RN, BSN, NREMT-P, C-NPT, CCRN, CMC, CEN, CFRN, FP-C, CPEN, as he demystifies both the common and less frequently seen lab values. You will explore a large variety of labs, why they are ordered, and what the results tell us about your patients. By understanding the clues that these values give you, you can utilize critical thinking to proactively plan the course of care and optimize patient outcomes. Why do you need an institutional product for your organization? The Institutional package includes the same great quality as our individual programs, with one huge difference: it gives you the ability to educate an unlimited number of users within your institution. You may load the product onto your company intranet for easy access, for staff members’ to view at any time convenient with their schedules. The institutional package includes PDF documents consisting of: seminar manual and Continuing Education request form, when applicable. This option is cost effective-at one low price, and renewable annually. If your goal is to provide quality education for all staff members, then look no further! With an institutional-use version, you get a "site license" allowing your institution to use the materials as much as you need them. You can make additional workbooks or even post all the materials on your intranet for staff to access. When you buy the institutional-use version, you obtain the license to use the program for an unlimited number of users (within one facility) as you wish* for a period of one year. Site license renewals are available. *By purchasing the institutional-use version, you do not assume copyright of the materials. The materials remain the copyrighted property of PESI and may not be edited, distributed to other facilities (even if they are in your organizations network), or sold for profit in any form. Illegally copying or distributing the materials is restricted by copyright law and prevented by your integrity. Evaluate the results of Coagulation Studies (PT/INT and PTT). Analyze a Complete Blood Count with Differential and discuss clinical applications (Anemias, Left Shifts, Infections, etc.). Recognize the clinical implications of metabolic panels. Distinguish between life-threatening electrolyte imbalances, as well as potential causes and remedies. Predict renal function based on BUN, Creatinine, BUN/CR ratio, and GFR. Interpret cardiac panel results in a suspected acute myocardial infarction. Analyze blood gases and pertinent clinical implications. Differentiate between bacterial meningitis and viral meningitis based on lumbar puncture findings. Recognize the key clinical indicators and implications for infection on a urinalysis. Urinalysis: Does Your Patient Have a UTI? Interpreting Arterial Blood Gases: It’s Easier Than You Think! Sean G. Smith is a flight nurse-paramedic who has practiced in Emergency Medicine, Critical Care, and Aero-Medical Transport (military and civilian). He holds degrees in nursing and molecular biology, is a graduate of Duke University's Legal Nurse Consulting program, and is currently pursuing a master's degree through the University of Florida College of Pharmacy. 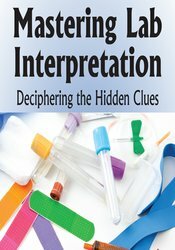 Career highlights include numerous author/co-author credits, including: the book Laboratory Tests Made Easy with Mikel Rothenberg (PESI, 2014), a best-selling Laboratory Medicine textbook, a chapter on Shock in Trauma Nursing Core Curriculum, and a section in the Resuscitation Crisis Manual (Leeuwin Press, 2018). Sean consults on clinical, legal and certification prep for numerous high-profile hospital systems, including Yale and Mayo. He routinely lectures at national/international healthcare conferences, has completed 50+ medical missions, and provides medical support to the NASA Space Shuttle Program. Financial: Sean G. Smith receives a speaking honorarium from PESI, Inc. Non-financial: Sean G. Smith has no relevant non-financial relationships to disclose. Save time and $10 off the price of other submission methods – purchase & take the CE test online for $9.99 USD per participant per program. Additional processing fees apply for other submission methods (i.e. mail, fax, etc.). Please contact our Customer Service at 1-800-844-8260 for more details. International CE rates may vary; please contact our Customer Service at 1-800-844-8260 for more details. Listed below are the continuing education credit(s) currently available for this non-interactive self-study package. Please note, your state licensing board dictates whether self-study is an acceptable form of continuing education. Please refer to your state rules and regulations. This self-study package may include multiple product formats. To receive full credit, please submit the CE test for each format that has self-study materials included. To access these documents, play disc #1 in your computer. Certificates of Successful Completion will be emailed, faxed or mailed to participants completing the post-test(s)/evaluation(s) and paying the CE fee(s). Nurses completing these self-study materials will earn 6.3 contact hours. Expires: 4/5/2020. AAPA accepts certificates of participation for educational activities certified for AMA PRA Category 1™ from organizations accredited by ACCME such as PESI. Physician assistants may receive a maximum of 6.0 hours of Category 1 credit for completing this self-study program.